Also this year our company JB was featured with an impressing and successful exhibition appearance on the LIGNA fair which is claimed as the most important wood industry and forestry fair. With qualified advice and customer-oriented product solutions our fair team lent anyone interested as well as existing customers their support for five days. Lots of new and branch-interested relationships were made and existing business relationships were maintained. 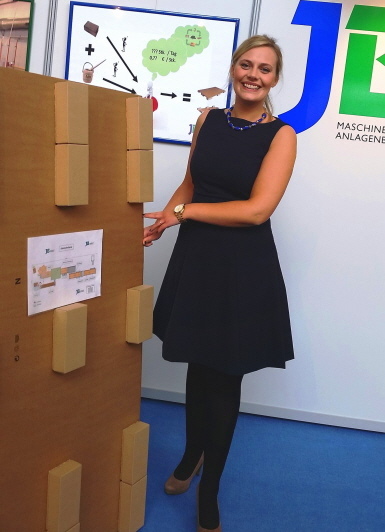 This year´s fair presentation and the interest of most of our customers was especially focused on machines for automatic production of cardboard pallets as well as packaging machines, the special field of JB. At this point we would like to thank for your visit at our stand and we are looking forward to a good cooperation with you! Also 2017 we will represent our business at LIGNA fair. In that year we will also celebrate our 20 year´s service with the company. We are looking forward to welcome you in Hannover also next time!